We love it when visitors come into our shop in Fairfax, Virginia. First time visitors are inquisitive about the differences from the “extra virgin” olive oil they know and use every day (the common grocery store type). For a distinct experience, we provide a first taste of an intense, robust selection, most often from Tuscany or Umbria. Cough, cough. Immediately, they grasp: there’s something better than the olive oil they have purchased elsewhere. 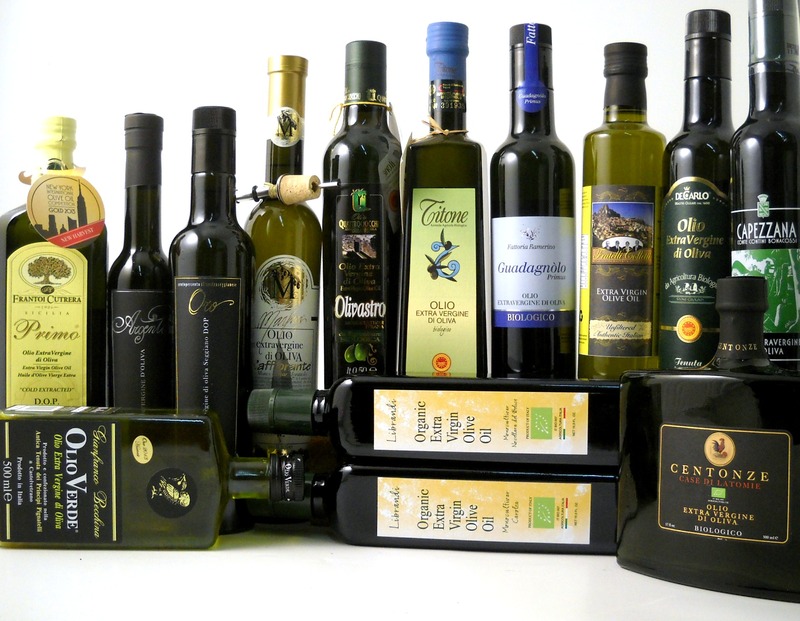 True, authentic, artisan-produced extra virgin olive oil from Italy. (Yes, we are all about Italy). 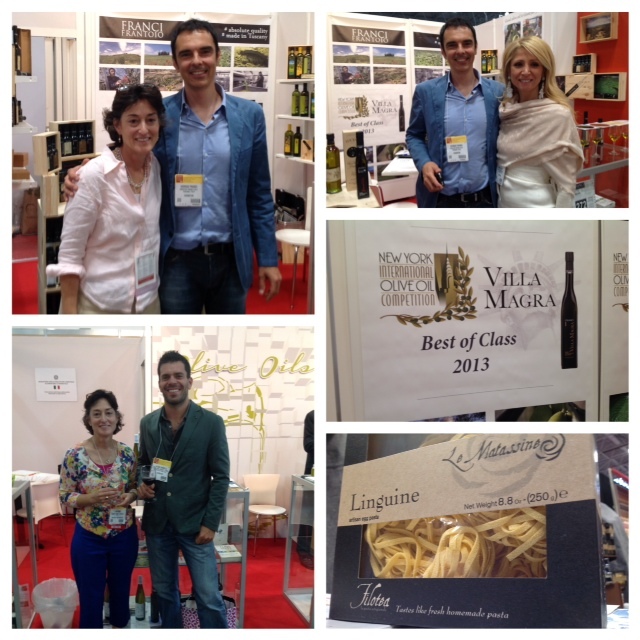 Our online customers have already become fans of great olive oil. They’ve been buying the good stuff for almost 14 years! What are the characteristics of fresh olive oil? Zingy, layered aromas, and distinct flavors. Some possess aromas of fresh leaves, such as crushed olive leaves, or the scent of tomatoes leaves as you brush by them in the garden. Others exhibit the rich fruity smell of an orchard or fruit market. Sicilian oils in particular bring forth grassy aromas, and others may note herbaceous scents. Take a taste. Does your olive oil evoke symphonies of flavors — a melange of artichoke, tomato, herbs, and grassy notes? Notes of apple, bananas, almonds, walnuts or flowers may come forth. Next comes the finish. It may be pungent and peppery (insert cough here) or milder and buttery–and still full of flavor. How is fresh olive oil made? Top quality extra virgin olive oils are harvested from just-ripening fruit. The olive fruits release relatively small amounts of oil at this early stage, but they are bursting with the healthy chemical properties many are seeking. The olives are picked when young, and bruised fruit are discarded. They are pressed within mere hours of picking, in carefully controlled conditions. (Those same trees, if picked weeks later, would yield significantly more oil, but it would be of lower quality, and likely sold in a mass market operation). Why are there so many extra virgin olive oil labels at Olio2go? Just as there are many wine selections to pair with food, there are many olive oil matches. If you know wine, you know that the grape varieties, micro-climate, year of harvest, and the winemaker’s skill make a great difference. There are significant parallels in the world of olive oil. 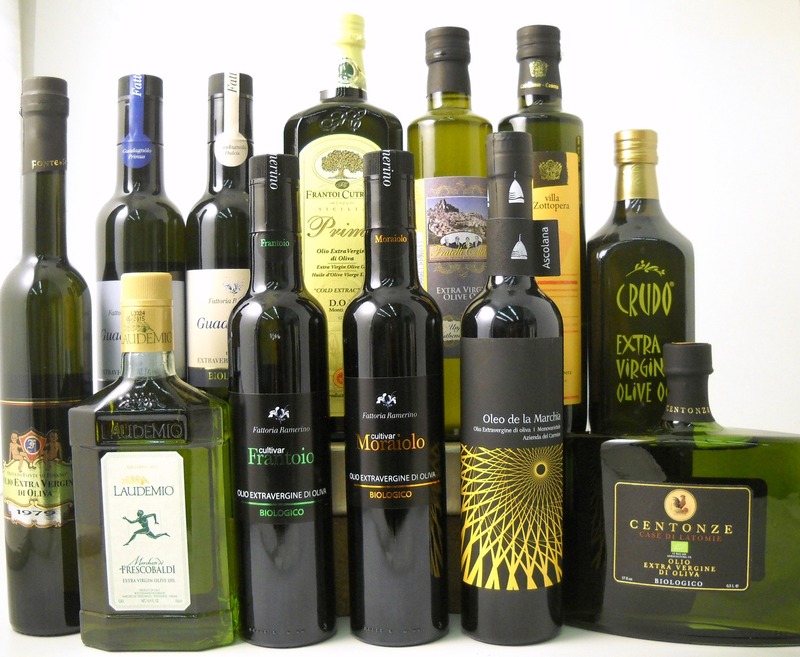 (And, many Italian wine makers also produce excellent olive oil). Whether you are purchasing a Tuscan olive oil for your grilled steak, or a Calabrian for your grilled vegetables, or a Sicilian for your fennel salad, the pairings will be perfectly matched. By tradition, some producers decant, while others bottle quickly after harvest. Early bottlings are most often unfiltered, yielding oils that appear cloudy or even milky. Some producers label their first bottles as Novello, meaning new oil. Whether labeled or not, all extra virgin olive oil, promptly pressed, bottled, and (first) released is Novello. 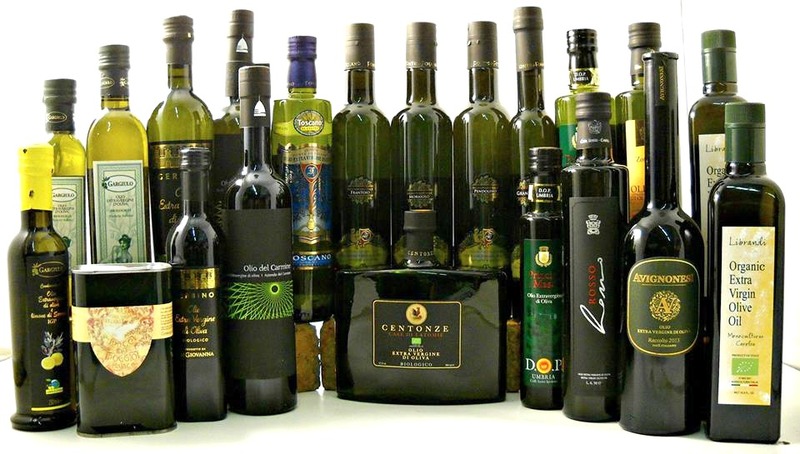 Just as there are many wine competitions with producers striving for top quality recognitions, there are important olive oil competitions and awards. Does olive oil get better with age? No! All olive oil will degrade in time. If you start with a top quality olive oil, store it well, and use it promptly once opened you will best enjoy this culinary magic. Some varieties of olives yield oils that last longer than others. Selections crafted from Frantoio olives (known best as a Tuscan variety) and Moraiolo olives (known best as an Umbrian variety) are among those with the best lasting power. As an olive oil ages, those distinct flavor characteristics fade. In time, the olive oil will taste flat and fatty–and eventually rancid. Our goal is to sell the current harvest olive oil as soon as it is available — and to sell out long before the “best by” date. What should I know about olive oil storage? Extra virgin olive oil is best kept in a cool, dark place. The selections on our shelves are for show. We prefer to “pull” your oil from our cool, low-light, temperature-controlled warehouse, where the oils has been kept in the dark, in shipping cartons. Where can I learn more about great olive oil? Click these links for more information on the anatomy of a great label, authenticity, organic certifications, and the most recent olive oil awards. 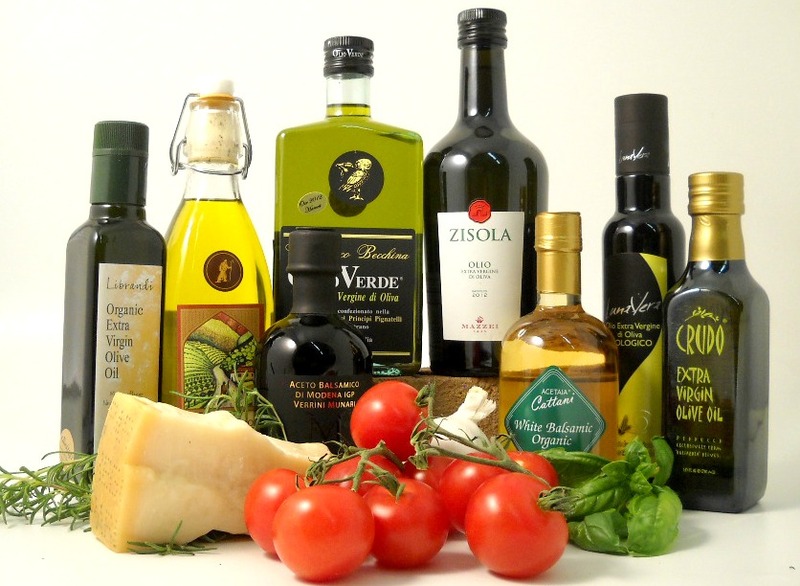 How can I purchase great olive oil? You can purchase online at Olio2go. There’s no minimum purchase and we offer a 10% case discount on six or more. Orders are shipped promptly! If you would like auto-shipping or an Olive Oil Club, please complete the form below to provide your address and budget. We will respond via email. This can be served warm as a side dish or cooler as a salad. This makes a large family or party sized dish. With the nutty grain and addition of fruit (raisins) this dish brings forth Sicilian style, making a Sicilian olive oil the perfect choice. As always, our salad recipes are guides – your tweaks and adjustments may be marvelous improvements. Note: Our farro package contains 3 cups of dried farro. When cooked, this yields ~8 Cups. You can cook the whole package and freeze the portion not needed immediately. It defrosts well. Start cooking the farro. Prepare the vegetables. 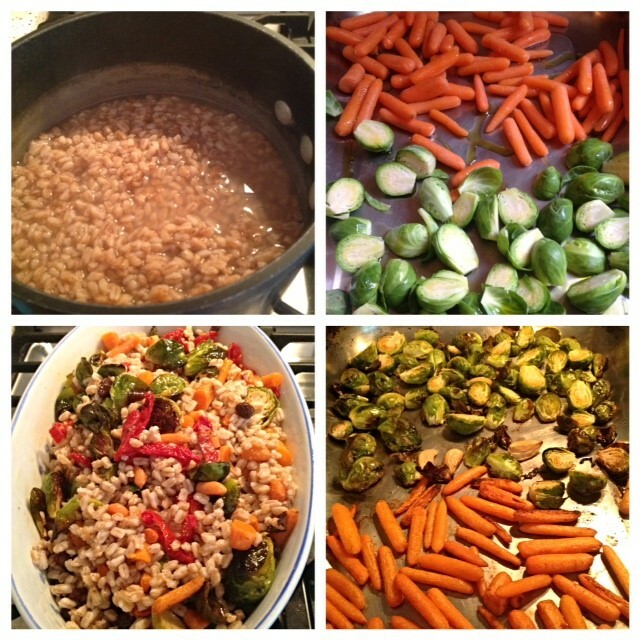 Cool the farro, add the roasted vegetables, sundried tomatoes, raisins, and dressing. Cook 1.5-2 C Farro by placing the farro in a pot, covering it with 1” of water. Bring to a boil, then lower the flame and simmer for 20 minutes. Drain and proceed. Trim ends and cut carrots lengthwise. Trim and halve Brussels sprouts. (Quarter large Brussels sprouts). Drizzle with 2-3T olive oil and roast at 450F for 20 minutes. Toss together. Let flavors marry for 20 minutes, then serve. 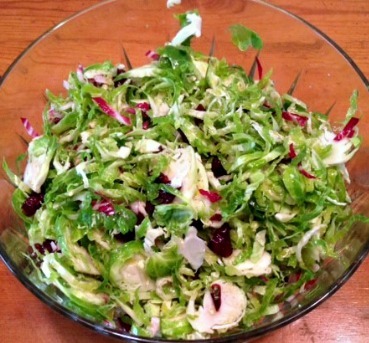 Perfect for late summer, grab some Brussels Sprouts and marry them with the flavors of orange and cranberry! This is not a conventional recipe, with exact measurements and precise weights. This is a taste-and-adjust recipe. Place thinly sliced greens and reds in a bowl. Add dried cranberries. Drizzle with Agrumato Orange from Abruzzo. Add salt and pepper as desired. Toss. Add Acetaia Cattani Organic White Balsamic Vinegar. Toss again. Let sit for 20 minutes for the flavors to blend before serving. Enjoy! Note: If you would like to mellow these robust flavors, subsitute another great extra virgin olive oil, such as Frantoi Cutrera’s Primo or Ravida, for a portion of the Agrumato Orange. If you’re looking for a flavor-filled experience, with Italian authenticity, we invite you to visit Olio2go enjoy the fabulous treats in this photo.